Now we are finally starting to greet the warmer weather again, don’t forget to ensure you protect your colour. The sun, wind and other natural elements are some of the major causes of reduced longevity of your colour. 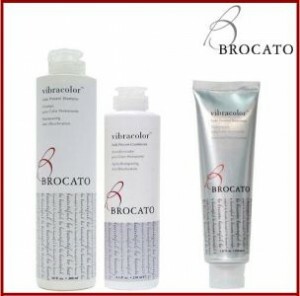 To keep your hair looking salon perfect for longer always ensure you use a good fade preventing and colour lock shampoo and conditioner like Brocato Vibracolor. Vibracolour apart from smelling amazing and leaving your hair in great condition, it’s propitiatory blend of sunflower seed oil and mango extract helps protect against elemental colour fading. This entry was posted on Thursday, February 4th, 2016 at 9:00 am	and is filed under Brocato products, QUICK TIPS. You can follow any responses to this entry through the RSS 2.0 feed. You can skip to the end and leave a response. Pinging is currently not allowed.